So there's nine more days til tax day and I still don't have a tax guy, my expenses are not itemized, and for once I might actually get something back from good old Uncle Sammy but seriously FREE ice cream is way more exciting to think about! Head on down to a MaggieMoo’s Ice Cream & Treatery on Tax Day, April 15th, and take advantage of another great“E-CONE-omic” Stimulus Package for upcoming Tax Day. Maggie Moo's will offer free ice cream to ALL its customers across the country to well, just make it a happy, non-stressful day. I am not lucky enough to have a local spot to run to and would love to hear what you think. Leave us a note if you've been to Maggie Moos and better yet if you were lucky enough to make it on the 15th for this great deal. Man! 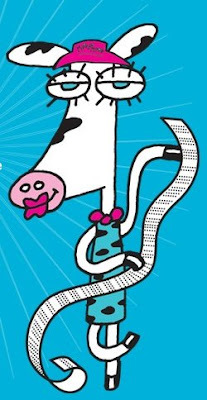 I want a Maggie Moo's. Darn. also a cute anecdote, an artist showed his love to ben and jerrys new flavour by curving little statues of ben and jerry and a cow ... so if you want to blog out of it I can send you pics of that too ! Celebrate 75 Years of Carvel with a Free Iceberg! Pickles & Ice Cream anyone....lip gloss that is!